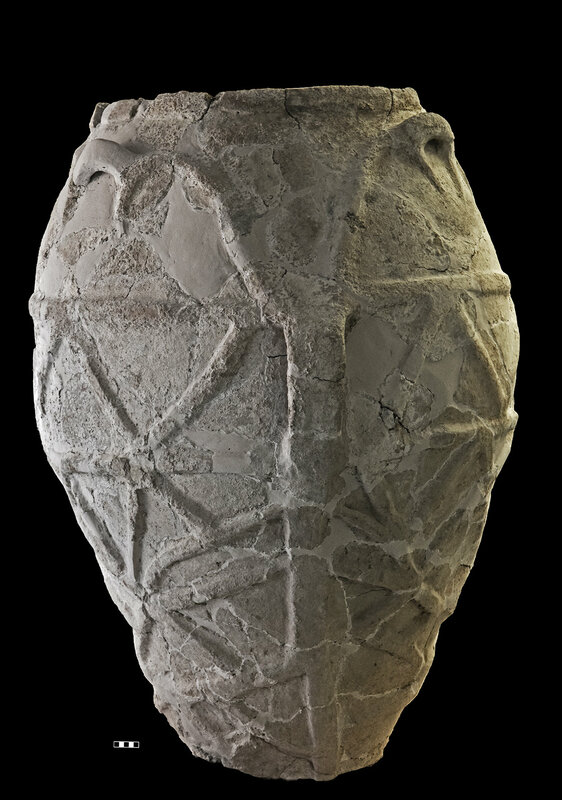 Italy’s oldest olive oil has been identified in an Early Bronze Age pot from Sicily. The vessel was discovered at the prehistoric site of Castelluccio about 30 miles west of Syracuse. It is the type site of the Castelluccio culture which flourished in southeastern Sicily between 2200 and 1800 B.C. and is known for its distinctive ceramics. That’s why when archaeologist Giuseppe Voza found 400 fragments in an excavation at the site in the 1990s conservators at the Archaeological Museum of Syracuse took the time and effort to puzzled them all together. Their hard work restored a unique pot unlike other ceramics found at Castelluccio: an egg-shaped storage container three-and-a-half feet high decorated with rope bands intersecting in a lattice pattern and three vertical handles on each side. Voza’s team also found two basins divided by an internal septum and a large terracotta cooking plate. “The shape of this storage container and the nearby septum was like nothing else Voza found at the site in Castelluccio,” said University of South Florida researcher Davide Tanasi. Researchers examined organic residues of an indeterminate nature contained in the pores of the three pieces of Castelluccio pottery. They used Nuclear Magnetic Resonance (NMR) and Gas Chromatography – Mass Spectrometry (GC-MS) to analyze the residue and found oleic and linoleic acids, signatures of olive oil, in each of the three samples. This find advances the known presence of olive oil in Italy by almost a thousand years and puts it on a par with the second earliest chemical signature of olive oil in the Mediterranean found in Chrysokamino, Crete. The results of the study have been published in the Royal Society of Chemistry’s journal Analytical Methods.